Delivery is by Royal Mail 1st class and packages are usually despatched the same working day. UK Delivery is FREE of charge for all orders over £30. UK delivery is £2.50 for orders up to £12. UK delivery is £4.50 for orders from £12 to £30. We also deliver to most parts of Europe, the delivery charge depends upon the value of the products in your shopping cart. Nab yourself a bargain in our Easter Sale ~ 15% OFF all products (except e-liquid bundles - already a big reduction). Use coupon code EAST15A on the checkout page. Sale runs from the 21st April to 28th April 2019. Add at least three bottles of UK-made 60% VG White Gold Formula e-liquids to your shopping cart and then use the coupon code WG10 on the checkout page. You can mix up the White Gold flavours and you can also add other items to your cart. This WG10 coupon code does NOT work with any other e-liquids. 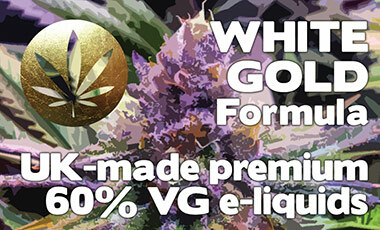 SEE WHITE GOLD e-Liquids. Just add at least six bottles of IceLiqs 10ml e-liquid to your shopping cart and then use the coupon code ICE65 on the checkout page. You can mix up the flavours and you can also add other items to your cart. This offer only applies to 10ml e-Liquids that are £4.99 each. SEE ICELIQS e-Liquids. Just add at least six bottles of £3.49 e-liquid to your shopping cart and then use the coupon code 6FOR5 on the checkout page. You can have a mix of flavours and brands and you can also add other items to your cart too. This offer only applies to e-Liquids that are £3.49 each. NOTE: use 12for10 if you want 12 or more £3.49 bottles, or 24for20 if you want 24 or more. You must be over the age of eighteen to purchase products from us. We do not sell products to minors. We reserve the right to cancel any transaction where we reasonably believe the purchaser is under 18 or purchasing products on behalf of a minor. Electronic Cigarettes and E-Liquids should not be used by pregnant women or people who are allergic to Propylene Glycol or Vegetable Glycerine. E-Cigarettes are not designed to help you quit smoking but are an alternative method of consuming nicotine. Nicotine is an addictive substance therefore only people who currently smoke should purchase and use e-cigarettes and e-liquids. If you experience any side effects, stop using your e-cigarette immediately and consult a Doctor. E-liquids may be poisonous if ingested. Keep away from children and pets. You can pay using PAYPAL or our secure card payment gateway provided by REALEX PAYMENTS. For your peace of mind and security our checkout pages are hosted on secure HTTPS servers, and we DO NOT retain sensitive card information. Our VAT number is 210723848. After you have placed an order we email you a confirmation, it will be from info@expressvapour.co.uk, please check your spam folder if you can't see it. Within the EU Consumer Rights Directive, you can return items (bought from www.expressvapour.co.uk only) for an exchange to alternative items or return for a refund or store credit, as long as you apply using the procedure below WITHIN 14 CALENDER DAYS of receiving delivery of your items. If you believe an item was faulty when received you may also send back for an exchange or ask for a refund or store credit. Please do this immediately. Any delay will lessen your chances of a successful defect claim. See also Warranty section below. Procedure: Login to your account, view the order using the "Complete Orders" link under the My Account menu and click the Return Item(s) button. We'll notify you via e-mail once we've received the returned item(s). You should expect to receive your exchange item, refund or store credit within 10 days of us receiving your package back, however, in many cases you will receive an exchange, refund or store credit more quickly. This returns and refunds policy is in accordance with the EU Consumer Rights Directive which came into force in June 2014 and is part of UK law. This law applies to all transactions within the UK where a consumer does not meet the vendor. Please note: Sorry, due to the nature of our products most do NOT have a warranty.